Aaron Leonard is author of Heavy Radicals: The FBI’s Secret War on America’s Maoists (Zero Books, 2015), and A Threat of the First Magnitude—FBI Counterintelligence & Infiltration: From the Communist Party to the Revolutionary Union—1962-1974 (Repeater Books, UK, January 2018). He lives in Southern California. 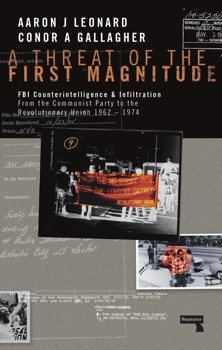 The following is based on research by Aaron J. Leonard and Conor A. Gallagher for their book, A Threat of the First Magnitude: FBI Counterintelligence & Infiltration from the Communist Party to the Revolutionary Union - 1962-1974, (London: Repeater Books, 2018). “Comrades: The time has come to throw off the shackles of revisionism and return to the Revolutionary principles of Lenin, Stalin and Mao.” — Ad Hoc Committee, 1962. “A specific example of the ability of [Special Agent] Stallings is the fictitious counterintelligence ‘Ad Hoc Bulletin,’ ostensibly published by the also fictitious Ad Hoc Committee.” — Personnel file of FBI Special Agent Carl N. Freyman, 1964. Among the Maoist organizations to arise out of the political tumult of the 1960s was a group known as the Ad Hoc Committee for a Marxist-Leninist Party (initially called the Ad Hoc Committee for a Scientific Socialist Line). The entity, begun in 1962, was said to be a secret faction within the US Communist Party working against the “revisionism” of Nikita Khrushchev and US party leader Gus Hall. That the entire operation was an FBI construct was a mystery to all but a handful of FBI agents and informants. The group began with an ambiguously named publication known as the “Ad Hoc Bulletin.” The inaugural issue was titled, “Whither the Party of Lenin,” a denunciation of Nikita Khrushchev for his “shameful retreat” during the Cuban Missile Crisis. Its second bulletin, picking up on the theme of the first, charged the US party with revisionism (revising Marxism in a non-revolutionary direction), “parroting Moscow’s soft line approach to imperialism.” It also called out the Kennedy Administration as a “fascist type administration,” which the CP was accommodating. A later issue, appearing in August 1963, insisted that, “All who share the revolutionary spirit of Marx, Lenin, and Stalin have watched with disgust the deterioration of our Party since the days of the militant leadership of comrade [William Z.] Foster.” The message was clear: There was a radical faction operating within the CP standing in opposition to the current leadership. As hyper-radical as the AHC came across, the force behind the program was an FBI Special Agent named Herbert K. Stallings. Stallings, in an internal FBI memo, is described as an “agent of high intelligence and tremendous imagination” whose “knowledge of Marxism-Leninism is broad and outstanding” (SAC Chicago, To FBI Director 1/22/1964). Under Stallings’s tutelage the Ad Hoc program continued for fifteen years, targeting not only the CPUSA, but the emergent New Left. [T]he Progressive Labor Party and the Worker’s Student Alliance, as I said before were offshoots of the Ad Hoc Committee, and the Ad Hoc Committee for a Marxist-Leninist Party had many who were still members of the CPUSA but were trying to move the CPUSA toward [a] Maoist position. Kirk, who did not know the true nature of the AHC, offers a description that is inaccurate, yet nonetheless provocative. The Progressive Labor Party (PLP) was started by actual communists, the former CP members Morton Sheer and Milton Rosen — and was not an offshoot of the AHC. It is the case however that the Ad Hoc Committee political “line” and the line of the Progressive Labor Party had key similarities. In that respect, it is hard to conceive of the FBI not using its Ad Hoc Committee instrument against PLP. Kirk’s statement – which left a confusing narrative — raised far more questions than it answers. The AHC also appears in the person of Morris Childs. Childs, who had been a leader in the Communist Party in the 1930s and 1940s, including a stint as editorial director of the Daily Worker, had been forced out in the wake of the anti-Earl Browder movement inside the party — Browder having been the leader of the CP in its peak years. Childs, however, returned to the Party, with the assistance of the FBI’s Carl Freyman (Special Agent Stallings’s supervisor), who arranged to pay Childs’s medical bills — he had a serious heart condition — in return for his becoming a Bureau informant. Childs would go on to become Gus Hall’s liaison with the Soviet Union, and the FBI’s most highly placed informant in the Communist Party for decades. Among his papers in Stanford University is a full set of Ad Hoc Bulletins suggesting not only his awareness of the program, but given the political sophistication of the latter documents – and his privileged position as key informant and CP leader — his participation. Then there are the New Left leaders, Jeff Jones and Bill Ayers of the Weathermen. Jones and Ayers, as Art Eckstein documents in his book Bad Moon Rising – met with the leader of a “Chicago Maoist group” in December 1969 who pitched a scheme to the two. The “Maoist” told them that the Chinese Communist wanted to support their group in return for their keeping the Chinese Party apprised of what they were undertaking. According to the Bureau, the Weathermen sent greetings to the Chinese but declined the offer. Ayers later told this writer that he recalls no such meeting and it is possible the Bureau has identities confused; however it need be noted that the report is part of an internal FBI memo authored by Stallings and was not written for public consumption. While the identity of the “55-year-old Maoist” is unclear — the Stallings memo describes him only as “a Chicago informant, a man of 55 who was a leader in a pro-Chinese communist group in Chicago” — all in all it sounds a lot like an Ad Hoc Committee operation. The file contains a photocopy of Fitch’s letter along with the envelope it was mailed in, addressed to the Ad Hoc Committee at their Post Office Box in Chicago. The Ad Hoc Committee would soon appear regarding the Revolutionary Union (RU) itself — a group of key interest to the Bureau as it was assuming the “China franchise” that Progressive Labor Party was relinquishing. In the case of the RU, the Bureau appears to have used the radical bona fides of the AHC to introduce an informant, Don Wright, into the Revolutionary Union. From back before Leibel [RU leader Leibel Bergman] had left the Communist Party in the late ‘50s, he had known this guy, DH [Donald Herbert Wright, known as DH Wright, or simply DH]. Within the CP some sort of caucus, or a sort of semi-secret group, had formed that was supposed to be more radical than the CP itself. And this guy DH had been part of this grouping in a loose sense, even while he had also been part of the Chicago area Panthers for a while (Bob Avakian, From Ike to Mao and Beyond, 27). According to the Bureau, Wright’s FBI file has been “destroyed.” However, given his leadership role, he repeatedly appears in other files; those files in turn have copies consistently routed to the Bureau’s “AHC” file. After Wright started working with the RU in 1970 he was rather quickly able to ascend to a position on that group’s secretariat, its four-person leading body. Wright’s chief accomplishment in that position appears to have been in assisting in the break-up of a coalition that had been established to form a new, pro-Maoist, Communist Party in the US. Specifically, Wright was the RU representative on the National Liaison Committee (NLC) consisting of the Revolutionary Union, the Black Workers Congress, the Puerto Rican Revolutionary Workers Organization (formerly the Young Lords Party) and the Asian-American radical group, I Wor Kuen. Using his unique position, Wright worked to sabotage things — arguing that the notion of a multi-national grouping was anathema to the need for independence of Third World revolutionaries. In other words, Wright, who had been tasked by the Revolutionary Union with bringing the groups together, played a critical role in driving them away from one another. Not surprisingly the “Ad Hoc Committee for a Marxist-Leninist Party” — which by then had been around for ten years without making a single step toward founding such a Party — weighed in, unsolicited, with a position quite similar to Wright’s. Writing to the New Left newspaper, the Guardian, they proclaimed that the “time for building a multinational party has not yet come.” The net result of all this was that the coalition fell apart and the Revolutionary Union was forced to form a Party without the presence of the other groups. The story of the Ad Hoc Committee is only now coming to light. The full reach of the program and all that it was involved is still largely hidden. The National Archives is currently in the process of reviewing 15,000 plus pages and will in the next year or so begin incrementally releasing the file. When that happens, some things will likely become clear, and it is quite likely that our understanding and assumptions of key aspects of that time, will change.